Is Hot Aisle Cold Aisle Dead? For years we have been zeroing in on the ultimate in cooling efficiency: Cool air ducted directly into equipment and hot air ducted directly out. The ducts carry the respective airstreams to and from HVAC equipment without mixing or leaking into the ambient room space. It has been a long journey from the early days of datacom cooling where we simply flooded the room with an abundance of cool air. Of course the assumption was that the cold air would migrate to where it was needed and the hot exhaust air would also find its way back. And just to be sure, we added plenty of margin—and dollars—to the system. Fast forward to today. Current equipment designs demand a steady flow of air to each device to maintain a suitable operating temperature. And we know that efficiency is maximized when we don’t mix the hot exhaust air with the cold supply air. Is it possible to accomplish both? Various solution providers have created just such a cooling utopia. By expanding the cooling system to use the ceiling plenum as the hot air return plenum and utilizing racks with exhaust chimneys, the hot air flows directly back to the CRAC units. The entire room essentially becomes a cold aisle. Taken one step further, an enclosed rack with ducted cold air supply, along with the chimney exhaust, directs the cooling air only through the equipment and the rack. Now the entire room can be virtually any temperature—warm or cold—and the equipment won’t mind. 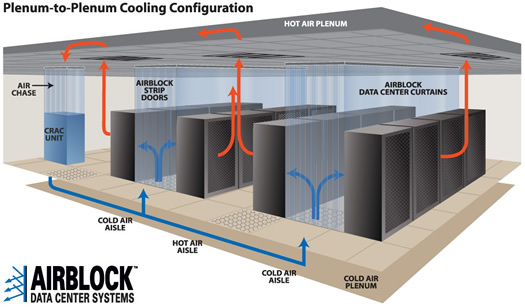 This cooling utopia isn’t free nor easy to achieve in an existing datacom environment. So what’s the solution when new racks aren’t an option, at least not today? What if the ceiling plenum doesn’t exist or isn’t practically available to serve as the hot air return plenum? Practical solutions are available to approximate the ideal layout outlined above. Such solutions essentially isolate the hot aisles or cold aisles from the remainder of the room. The isolation prevents, or at least limits, the mixing of supply and exhaust airstreams. The result is better control of each with the potential to raise the supply air temperature and reduce cooling expense. The most economical solution is a curtain system which hangs from the ceiling along the rack rows. Various options with this system make it an excellent interim solution while planning and preparing for the ultimate cooling solution in the long term. More Information on Data Center Curtains. Apakah Power Usage Effectiveness - PUE?